We had such a lovely weekend!! Sante was such a character! I visited him on Thurdsay to take his rug off - Due to the rain & cold temps last weekend, i had put his winter rug on him, in an attempt to help his lameness, On Thursday, the sun was shining, and it was a very warm 30ºC. So, I made the 45 minute trek down to see him. He was quite happy to see me, which was nice~ quite happily came out of hte paddock! We just mosied around, and I eventually put him back in the paddock in the early afternoon, and managed to take some happy snaps. It was just lovely, because he was in no hurry to leave, and just wanted to be with me. 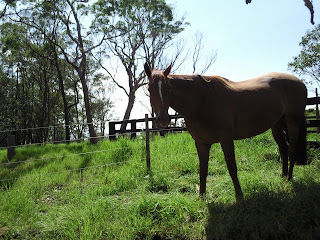 His paddock mates were well and truly within eye sight, and still, he stayed. expending the least amount of exercise possible, by moving the front feet only, and not bothering with the backs. Bare in mind, while this is happening, all that can be heard is blissful groaning. Whatever he did, must have stretched a tight muscle in that great big body of his, he was in his element. 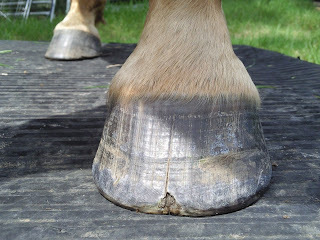 I also managed to get updated photo's of his feet! Yes, I know, it's been far to long. It's been four months now, since i pulled the shoes off. He's got a few minor infections, but other than that, everything has gone swimmingly! his RHS still looks a lot worse than the LHS, but eventually they will be perfect! 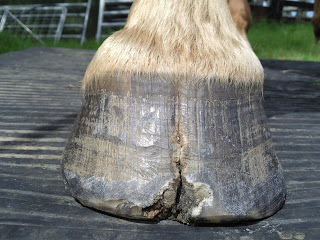 So you can gauge our improvement, I posted updated photo's on his feet in November - Click Here! to check them out. Major difference hey!! Anyway - On to the fantastic weekend we had. I arrived on Saturday, and when Sante saw me, he nickered, and wandered straight over. I was just thrilled!! With all the riding that we've been doing, I have noticed that ou r catching game has been, well.. sick. So to see him so happy was just brilliant! We mosied out of hte paddock at liberty, he got a good feed, and groom, and i asked him for a few light circles, to ascertain that he was still slightly sore. It was so slight, i was considering the possiblity that he might be ok tomorrow. Anway, I spent most of the day talking ot people about the Parelli clinic. 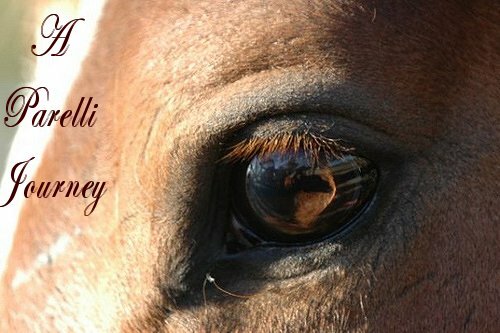 There is a lot of interest, and I think its fantastic that so many people are looking for a more natural approach to their horsemanship. 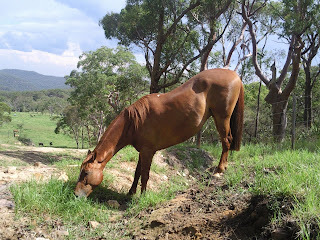 I really didn't do anything more with him on Saturday than spoil him rotten, and put him back in the paddock. We did a little bit of work on Stick to me - so that when i lift my left leg, he lifts his left leg etc etc, he is getting VERY good at it. We again, had breakfast, and got a very nice grooming, but this time, i decided to do some light games in the grass arena just to enourage some light movement. We worked on the patterns - Figure of eight at the walk, and imagine my surprise when we got it at the trot! He still needs a little bit more practise at it, he tends to fly past my right shoulder without taking the turn, I just interrupt the pattern, and gently redirect him, and he kind of says "woops, my bad" and continues as if nothing happened. After a few minutes of that, we went back to the figure of eight, and had a go at liberty. He did it!!! Just at a walk - but it was awesome! After a few of those, silly me, was supporting the shoulder through one of the turns, and didn't release the pressure soon enough, imagine my surprise when sante veered of course and found another rubber tyre (there were tyres scattered through the arena, we were using two for the pattern), went around it and came back to me, our game ended up being a kind of weave aroun the triangle pattern, All the while, he kept his ears on me, and never once did he stop asking questions. I was so thrilled with his efforts, that we stopped the session right there, and i put him back in his paddock, with his mates. I had my pockets stuffed with carrots, so we played a little more at liberty until all the carrots had run out - which was timely, he was offering these beautiful close circles which i was just drooling over. 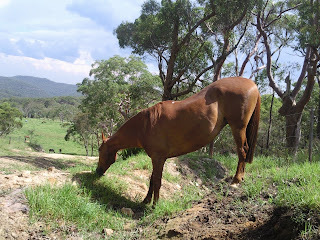 A friend of mine entered the paddock to catch her horse, and when i was satisfied that Sante was now happy to be with his mates, i turned to leave with her, only to feel that beautiful sensation of horse breath down my neck. He followed me back out!!! I sat with him, at the gate, just moseying, picking grass for him, and patting him, until finally, 20 minutes later, he was happy to rejoin his friends. I love the photos of him with his hind end straight up in the air! :) Great shots! !